A crisis has rocked the People Democratic Party over the misappropriation of campaign fund. The party presidential candidate Atiku Abubakar has said to be overburden by the excessive demand of fund from him. The Senate President Bukola Saraki is not very happy with the channels the PDP campaign fund is passing through. He has accused Atiku and the party of channelling the fund through the chairman of the party Uche Secondus rather than through the Presidential Campaign Council where he serves as the Director General. Saraki also complained that the money made available for the campaign is nothing to compare to what they spend to run the campaign service across Nigeria. A close source revealed to our reporters that sourcing for the fund for PDP campaign has been the major problem. The Party bigwigs are doing everything to keep this away from the public pending the conclusion of the Presidential election. Atiku Abubakar and Saraki are trading word about this issue while they accused the party chairman of deliberately hold the campaign fund. An investigation showed that Atiku Abubakar has been sole funding of the PDP campaign programmes. The National Executive Committee (NEC) of the Peoples Democratic Party (PDP) although set up a Fund Raising Committee which is headed by Governor Emmanuel Udom of Akwa Ibom State. In many occasions, the National Executive Committee (NEC) has complained of lack of fund forcing Atiku Abubakar to realise money to fund his campaign. 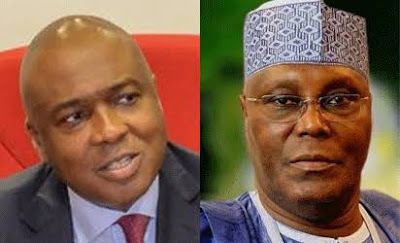 Bukola Saraki has threatened Atiku Abubakar that he would quit if he fails to address the issue. He accused National Executive Committee (NEC) of misappropriating the campaign fund. Atiku has pleaded with him to be calm but the frustration is getting over his head. Recall that the All Progressives Congress (APC) yesterday alleged that opposition Peoples Democratic Party (PDP) presidential candidate Atiku Abubakar is finding it difficult to raise cash to fund his campaign. We shall continue to update you as it unfold.